Facebook users “like” more than 4.1 million posts every minute of every day. That means they like almost 250 million posts every hour. Tinder users swipe more than 590,000 times every minute of every day. That means they swipe past more than 35 million potential lovers every hour. Uber users take almost 700 rides every minute of every day. That means they’re taking more than 40,000 rides every hour. That’s a lot of Facebook liking, Tinder swiping and Uber ride-hailing. It’s kind of mind-boggling if you stop to think about it for, say, a minute. All of that activity means that a lot of data is being created. Each like, swipe and ride represents the creation of data that lives on the Internet. 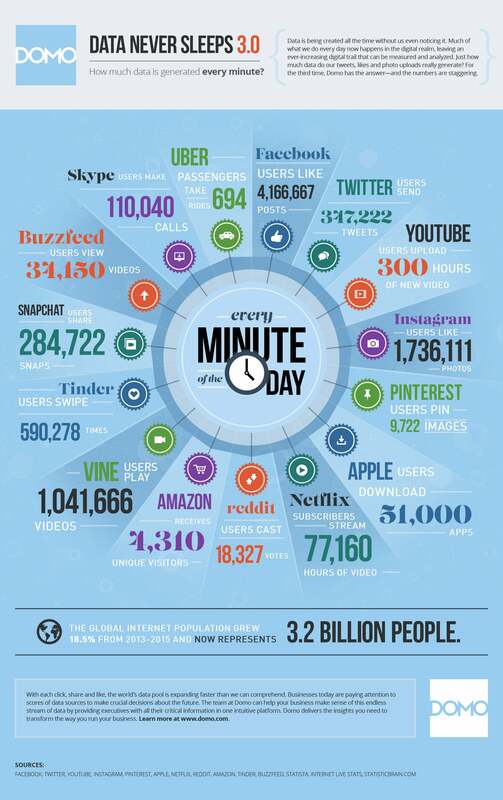 For a deeper look into how much data is created every minute, have a look at the infographic embedded below compiled by Domo, a cloud-based business management platform.